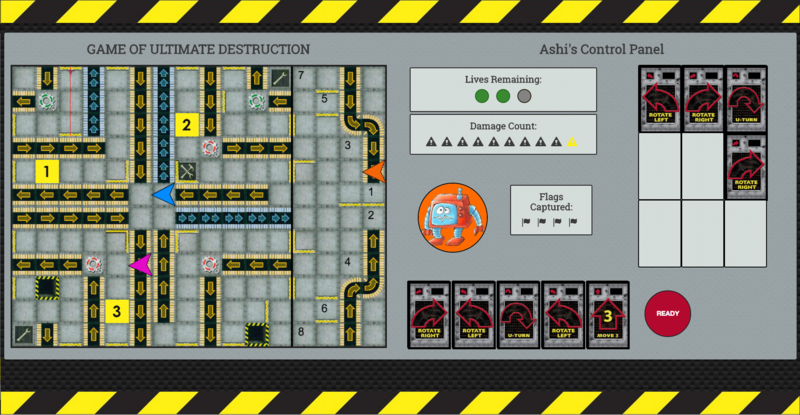 Robo Mayem is a web version of a popular board game called RoboRally. It’s a multiplayer strategic game in which players race to reach multiple checkpoints, while moving across a perilous course. The goal is to be the first player to touch all the specified checkpoints in order. Each player is dealt nine cards, which include specified movements. Players must strategically plan out their movement to reach each checkpoint, taking into consideration the various obstacles along the way. Getting to the checkpoints isn’t always simple, since moves are executed at the same time as other players, with certain moves taking priority over others. Our game logic is designed on the back-end to calculate each player’s position and metadata based on the cards selected and game board elements, such as conveyor belts and spinning gears. We utilized Firebase to effectively communicate the game state to each player. On the front-end, we used Pixi.js to generate game boards and transport players based on calculations performed by the game logic.